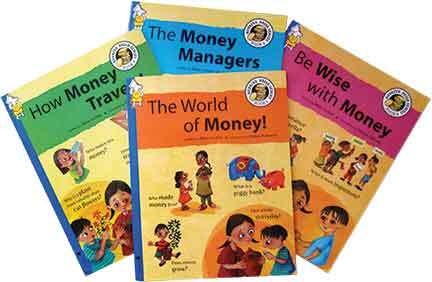 The next time you feel like telling a child ‘Money does not grow on trees’, you might want to pause and introduce him/her instead to a series of books that promise to give children a better understanding of how money works. The Rupaiya Paisa series, written by Mala Kumar and illustrated by Deepa Balsavar, consists of four books published by Pratham Books, a not-for-profit organization that creates books in multiple languages to promote reading among children. The books are titled The World of Money!, How Money Travels!, The Money Managers, and Be Wise With Money. Published in 2013, this series was developed with the support of Parag: Promoting Innovative Publishing in Education, an initiative of Sir Ratan Tata Trust. The books are interestingly written, scattered with stories and real-life examples to help the reader understand complex ideas in the context of their immediate, everyday lives. Concepts like receipt, payment, transaction, income, expense, interest, liability, money transfer, chit fund, insurance, risk, premium, self-help groups, microfinance institutions, subsidy, philanthropy, etc., are stripped of the vagueness they might hold for someone who is encountering them for the first time. 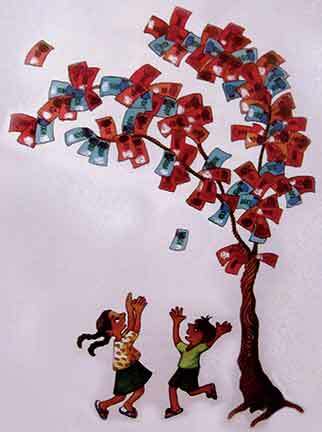 The illustrations are simple and playful; for example, a tree laden with red and blue currency notes of various denominations in place of leaves, and two children dancing underneath waiting for them to be shaken by the wind and drop to the ground. This sense of play is also seen in the language employed by the author. Assets, for instance, are compared to safety nets used by trapeze artists in a circus. The visual style also draws on the form of the comic strip, with a variety of characters and conversations framed in speech bubbles. The layout ensures that the reader’s eye is not assailed by too much text. Boxes filled with trivia make an occasional appearance, as do useful tips on how to handle currency notes, simple ways of saving money, do-it-yourself activities, and open-ended questions for the reader to ponder. The visual appeal is also enhanced by images of currency notes from Sri Lanka, Iceland, Papua New Guinea, Britain, Australia, Nepal and Central Africa, and old coins minted by the East India Company. There is an interesting page on how different people earn in different ways – teachers, traders, doctors, taxi drivers, brokers, artists; how some people earn a fixed salary, others get paid based on the amount of work they do on a particular day, and how some others are self-employed and determine the price of their own work. There is also an acknowledgement of the distinction between paid and unpaid work. While adults can certainly use excerpts from these books to discuss ideas with children, the publisher recommends that they be used as ‘Level 4 books’; meant for ‘older children who can read with confidence’. Each book costs Rs. 40, so the entire series is available for Rs. 160. The reviewer runs People in Education, an e-group connecting various stakeholders who care about learning in schools and other spaces. He can be reached at chintan.backups@gmail.com.